spans the East river between Manhattan and Brooklyn. When opened in 1883 it was the longest suspension bridge in the world. Designed by John A. Roebling the span is 1595.5 feet long and the towers are 276.5 feet tall. 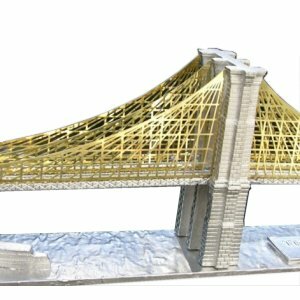 The towers, roadway and riverbed / anchorages are cast in pewter, the suspension wires are brass. The model stands 3.25 inches tall and stretches 23 inches long.